Paris stirs the imagination like no other city in the world. It is associated with culture, architecture, art, fashion, fine food, pavement cafés and savoir vivre. In other words, with all the good things in life. Superlatives are out of place in any attempt to describe the city of cities. Le Jardin des Tuileries, Le Palais du Louvre, La Notre Dame, La Tour Eiffel, La Basilique du Sacré-Coeur, L'Arc de Triomphe. These names, which sound like music, áre superlatives. They need no further explanation. They say it all. Want to be a neighbour of the Bastille? Live a stone's throw from Île de la Cité? Have "your" Jardin de l'Arsenal outside your door? Stroll along the banks of the Seine? Spend a day or two visiting the Louvre? Living in a top location in Paris would appear to be the sole preserve of the rich of this world. 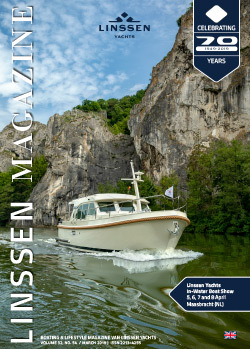 But let's talk about the added value of owning a Linssen... Your boat will allow you to achieve the ultimate exclusivity of living in the heart of Paris in an inimitable way! For a few days? For a week? For a month? Or would you prefer a year? Anything is possible. Your temporary address: Port de Plaisance Paris-Arsenal. The Bassin de l'Arsenal is located at km. PK-168 on the Seine. You reach it via the Pont Morland lock just before Île Saint Louis and Île de la Cité. You can contact the Capitainerie (harbourmaster's office) from 08.00 a.m. to 08.00 p.m. du­ring the summer months. Bruno, Guillaume or Bernard are at your ser­vice and will do everything in their power to make your stay in Paris as pleasant as possible. You can also count on them if your yacht is staying in port for a prolonged pe­riod, awaiting your next visit to Paris. The Bassin has a unique ambience. The Jardin de l'Arsenal, right on the harbour quay, is a colourful park where people can enjoy a peaceful moment in the sun. On the terrace of "Le Grand Blue", the cosy harbour restaurant, a Leffe Blonde beer tastes like it tastes nowhere else. The service facilities are excellent. Toilet facilities, launderettes, telephone, filling station, oil depot, parking spaces and much more besides are available for the approx. 180 moorings. The "Bastille" metro station, your own gateway to the city, is a minute's walk from your Linssen. The Avenue des Champs Élysées, St. Germain des Prés and the many big stores are already looking forward to your visit. Even the Louvre is only a stone's throw away, as are so many of Paris's attractions. And after a sultry summer evening spent enjoying Montmartre, cast your eyes over Paris from the steps of the Sacre Coeur and make sure to have a good bottle of wine and two glasses. It's hard to imagine a more romantic toast to your little floating ‘palace’ in Paris.